Canada is making a name for itself as a distinct North American market on the global investment scene. Despite global macroeconomic challenges, the good news is that the Canadian private equity market maintained a steady pace of deal activity in 2012. Deal volume remained generally stable from quarter to quarter, showing a slight increase compared with deal volume in the same periods in 2011 (see graph 1.1). There are signs that this deal pace will continue in 2013. There was also a large corresponding increase in total deal value (28%) over 2011 (see graph 1.2). 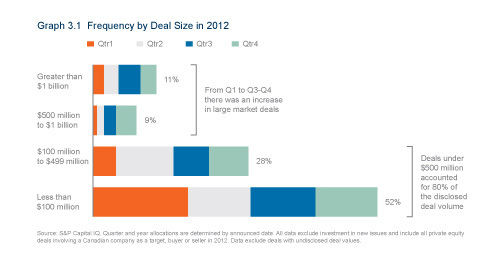 Private equity firms have been most active on the sell side in 2012 (see graph 2.1). This is consistent with the recognized need for PE firms to realize returns on their investments as their funds near the end of their life cycle. As pressure continues to mount and debt remains readily available, we expect that financial sellers will continue to pursue their exit strategies. In this context, secondary buyouts (the sale of a portfolio company by a PE firm or pension fund to another financial buyer) are definitely on the rise in Canada, having tripled relative to other exit strategies since 2009 (see graph 2.2). Recent secondary buyout transactions in the Canadian market also tell a compelling story. These transactions include Madison Dearborn Partners’ purchase of a majority stake in QuickPlay Media, Inc. from investors such as Ventures West Capital; and Vector Capital’s acquisition of 20-20 Technologies from Desjardins Venture Capital. 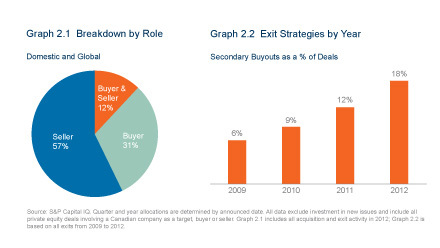 In many cases, secondary buyout deals in 2012 involved sales from smaller funds to larger funds, suggesting that capital infusion was required to bring these investments to the next level. That being said, the vast majority of private equity transactions in Canada in 2012 remained in the low- to mid-market, with deals of less than $500 million accounting for 80% of the disclosed deal values, similar to the experience in U.S. private equity markets. Canadian transactions were predominantly less than C$100 million (see graph 3.1). Club Deals: A Canadian Phenomenon? Club deals with multiple financial buyers (including pension funds) dropped slightly in Canada in 2012, down to 40%, from 47% in 2011, of transactions involving Canadian targets. This can be explained, at least in part, by the noted downshift in deal size this year (see graph 3.2), suggesting that there may have been less need to pool assets to fund these investment transactions. However, on the large Canadian buyouts in 2012, a significant portion reflected a club deal structure. With the increase in large (greater than $1 billion) deals over the course of 2012 (see graph 3.1), we expect that club deals will continue to attract interest in 2013. The Canadian energy and natural resource sector and the infrastructure sector are, by far, drawing the largest investments by deal value; however, deals are being done across a variety of other industry sectors, presumably a reflection of the stable Canadian economic environment compared with other regions. 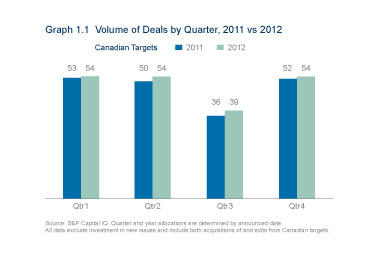 Inbound investment activity into Canada is growing in importance within the Canadian domestic market, with the proportion of deals with a foreign buyer of a Canadian target having steadily increased since 2009, and now accounting for nearly half of Canadian deal activity in 2012 (see graph 4.1). Of this inbound activity, U.S. buyers continue to be the most active of foreign buyers, followed by European buyers (with U.K. investors being the most common). Canadian private equity firms are concurrently increasing their focus outside Canada. Outbound private equity activity has been robust, and over the past three years has represented a growing portion of the overall Canadian private equity landscape (see graph 4.2). As foreign investors enter the Canadian market, they continue to grapple with the continuing regulatory uncertainty surrounding Canada’s foreign investment review regime. As a result, we are seeing that in a number of transactions, sellers are looking to secure deal certainty with the increased use of "hell-or-high water" types of covenants. For example, in some instances, the buyer has committed to take a number of steps to close the transaction, including any action (such as divestiture of a business or asset) to obtain the regulator’s approval. More commonly, buyers are agreeing to undertake structural changes to secure regulatory clearance, but subject to certain limits, such as not disposing of assets if this would have a material adverse effect on the buyer or the target, or if this would result in a material detriment to their businesses. In terms of pricing risks, the use of earnout provisions in Canada (whereby part of the purchase price is calculated by reference to the future performance of the target’s business post-closing) seems to have remained relatively uncommon (appearing on less than 20% of the deals that Torys was involved in during 2012); this was the case despite market predictions that the use of earnouts will rise as parties look to bridge valuation gaps in an uncertain market. Although buyers view earnouts as a solution to narrowing the pricing gap, our experience has been that sellers in an auction process will heavily discount earnout contingents on the assumption that satisfying the relevant performance terms will be difficult and not within their control. Further, as an alternative to purchase-price payment deferrals, purchasers are continuing to insist on escrow provisions in order to safeguard against indemnity claims relating to specific pre-closing risks assumed by them in relation to the target. For example, approximately half of the private acquisitions that Torys worked on in the second half of 2012 included escrow provisions, following a similar trend in recent U.S. private acquisitions. A number of factors point to a positive outlook for Canadian private equity markets in 2013. We expect that private equity firms will invest excess cash reserves and dispose of investments to realize returns – continuing the rising trend of secondary buyouts we noted in 2012. We also expect that the Canadian energy and natural resource sector will remain of interest to investors as demand for commodities continues to rise. However, parties will continue to focus on structuring their transactions to address regulatory risk and secure certainty of closing against the backdrop of global uncertain markets.